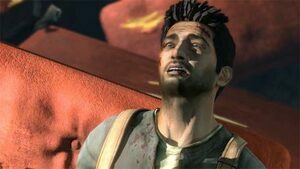 Uncharted 2: Among Thieves' Believable Characters Are A Paradigm Shift In Video Games. I don't want to spoil things for those of you who haven't played Uncharted yet - although you really should be asking yourselves 'why not?'. I just want to say - right here, right now - for my weekly column, that Uncharted 2: Among Thieves is without doubt the best written video game of all time. I really hope that in years to come, people will remember Naughty Dog's name as the first development house to truly bring story and character into games. Often a game will use story to add context to a number of levels; Uncharted 2 uses levels to tell story - and it really is a paradigm shift in the industry based on just how much the bar has been raised. The potential was always there in Uncharted: Drake's Fortune, but Uncharted 2: Among Thieves brings that to the next level. You might look at games such as Fahrenheit, Shenmue and Grand Theft Auto as other experiences that have paved Naughty Dog's path to this point. But personally, I feel Uncharted 2 is at another level. It's not just in the world and the characters, but just the simple writing. For me the acting, voice work and character development rival that of a Hollywood blockbuster; putting many to shame. Aside from the clear Indiana Jones inspiration, the performances of everyone involved are seriously breath-taking. And totally engaging. The game's pacing is also brilliant. Mixing up the sometimes relentless pace video games are known for, Uncharted 2 is polished enough to step back from time to time - like the best movies - and give the audience a breather. I hope Uncharted 2: Among Thieves will go down in history; not for its refined gameplay, but it's inspirational story-telling. Twiggy is an anonymous PushSquare columnist who has been spotted in three major cities across the globe. Its rumoured hes on the run from the British monarchy who accused him of treason. Why Is Everyone So Angry About The PSPgo? Why Do People Promote A Single System Future? The Digital Download vs. The Peripheral, Is The Video Game Industry Moving In Separate Directions? The Importance Of Exposure Against An E3 Splash: Which Is More Important? Does The Playstation 3 Need Motion-Control & How Will Sony Apply It? Why Did Guerillas Killzone 2 Force Me To Kill The More Interesting Good Guys? I Hate The ISA!